TORONTO - As Dustin Pedroia was being asked about envisioning his team as the recipient of Roy Halladay in any potential trade, the Red Sox second baseman interrupted. “For him to get traded before the game?’’ Pedroia asked. “That would be nice.’’ By that point, though, it was too late. Halladay had pitched well enough yesterday to leave other general managers salivating, and the Blue Jays with yet another brilliant outing to demonstrate the worth of the best chip currently up for sale. 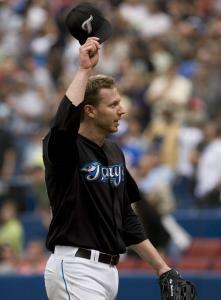 With the Red Sox in the visitor’s dugout, Halladay was still a Blue Jay and still his outstanding self in a 3-1 win that gave Toronto the series. The Sox scored a run in the first, and had two men on in the third. Then, nothing. Of their final 21 batters, just one reached base with a hit, when David Ortiz singled in the sixth. No runner reached scoring position after the third. Halladay was on. Chances were gone. In the sixth, seventh, and eighth innings, the Sox led off each with a first-pitch out, by Kevin Youkilis, Jason Varitek, and J.D. Drew, contributing to Halladay’s exceptionally low pitch count. He threw just 105 in a complete game, his fifth career against the Red Sox, and his fourth of the season. “Typical,’’ Sox left fielder Jason Bay said. “Getting a lot of early swings. We’re a team that a lot of the time works counts and takes pitches. There’s a few [pitchers] that that’s not really conducive for. I think he’s one of them. Because you look at his strike-to-ball ratio. It’s ridiculous. You know he’s throwing strikes. Before the game I saw he had the 100-something punchouts  and like 17 walks. And the Sox did. After Drew struck out to open the game, Pedroia singled, and Youkilis doubled. Ortiz hit a sacrifice fly to right, scoring Pe droia and moving Youkilis to third. Then Bay, with the chance to create a bit of separation early, necessary with Halladay on the mound, just missed a pitch. He hit it well, just not well enough, and it settled into Alex Rios’s glove on the warning track in center field. Though Jon Lester pitched well enough to win, giving the Sox seven solid innings, allowing three runs on five hits, it wasn’t good enough against Halladay. The loss could be directly attributed to a pair of walks in the second inning, two of four Lester would allow on the afternoon, something Francona attributed to a nine-day layoff between starts. After striking out Scott Rolen to start the inning, Lester walked Lyle Overbay and Rios, then got Kevin Millar to pop foul to catcher Varitek. Rod Barajas then picked an excellent moment to end his 0-for-20 skid, hitting a double to left to drive in two runs. Though that was all Halladay would need, the Jays added a third run when Barajas hit a sacrifice fly to center to score Overbay in the sixth. Those weren’t the only calls with which the Sox quibbled. There were a couple of conversations with plate umpire Eric Cooper, including one with Nick Green (and Francona) and one Mark Kotsay walked away from shaking his head. And he knew it would be tough against Halladay. After the third inning, there was little the Red Sox could do. Halladay controlled them, never letting up, until Jacoby Ellsbury struck out swinging to end the game, as the 36,534 at Rogers Centre gave Halladay a roof-shaking ovation.